Our latest edition of Highlights has just been published. It gives an overview of our work in educating water professionals, conducting high impact water research, and capacity development projects around the world. 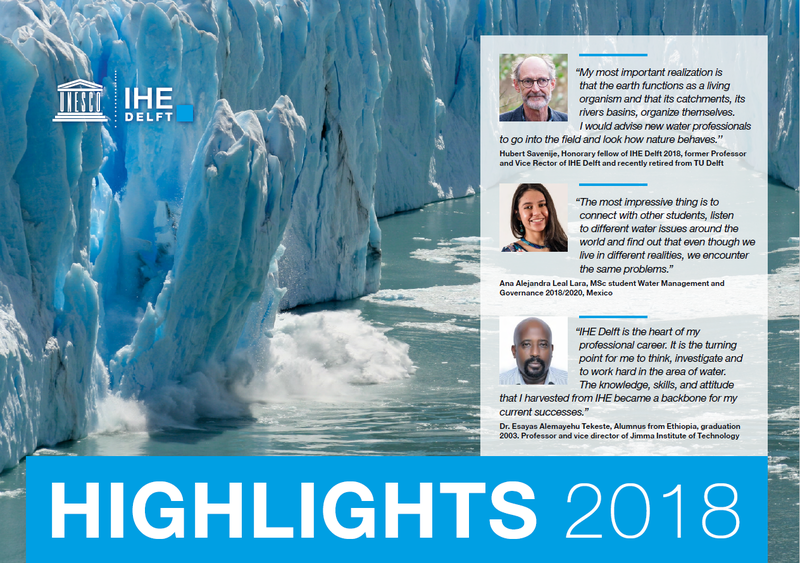 This new-look Highlights presents a snapshot of some of the many activities of IHE Delft in 2018. We have grouped these under the four main global water challenges (too much, too little, too dirty and too hard to access water), which correspond to those in our new video and are in line with the Sustainable Development Goals in which water is key, especially SDG 6. The work of IHE Delft, in collaboration with its partners throughout the world, has never been more urgent and relevant. Working in partnership to create impact on the ground is also the key approach to our Partnership Programme for Water and Development, a collaboration between IHE Delft and the Dutch Ministry of Foreign Affairs, which supports more than 70 projects worldwide. We are working hard to develop a strong foundation of knowledge through our education, research and institutional strengthening activities and 2018 was indeed a year of positive impact, with still much more to be achieved. You can download the booklet on the right side of this page.